Lihue, Kauai is home to Kauai's main airport and has plenty of beaches, natural wonders, and water sports. 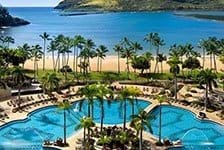 Find hotels close to Kalapaki Beach or stay oceanfront and enjoy panoramic views of Wailua Bay. Lihue hotels offer tranquility, amazing views, and luxurious amenities.